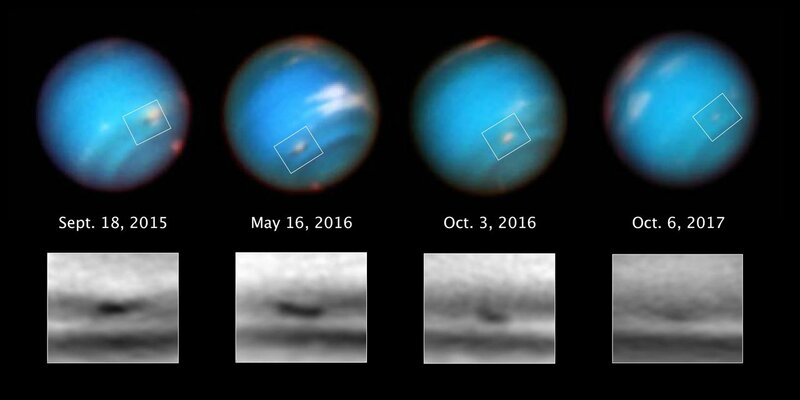 Three billion miles away on the farthest known major planet in our solar system, an ominous, dark storm - once big enough to stretch across the Atlantic Ocean from Boston to Portugal - is shrinking out of existence as seen in pictures of Neptune taken by NASA's Hubble Space Telescope. Immense dark storms on Neptune were first discovered in the late 1980s by NASA's Voyager 2 spacecraft. Since then, only Hubble has had the sharpness in blue light to track these elusive features that have played a game of peek-a-boo over the years. Hubble found two dark storms that appeared in the mid-1990s and then vanished. This latest storm was first seen in 2015, but is now shrinking. Like Jupiter's Great Red Spot (GRS), the storm swirls in an anti-cyclonic direction and is dredging up material from deep inside the ice giant planet's atmosphere. The elusive feature gives astronomers a unique opportunity to study Neptune's deep winds, which can't be directly measured. The dark spot material may be hydrogen sulfide, with the pungent smell of rotten eggs. Joshua Tollefson from the University of California at Berkeley explained, "The particles themselves are still highly reflective; they are just slightly darker than the particles in the surrounding atmosphere." Unlike Jupiter's GRS, which has been visible for at least 200 years, Neptune's dark vortices only last a few years. This is the first one that actually has been photographed as it is dying. "We have no evidence of how these vortices are formed or how fast they rotate," said Agustín Sánchez-Lavega from the University of the Basque Country in Spain. "It is most likely that they arise from an instability in the sheared eastward and westward winds." The dark vortex is behaving differently from what planet-watchers predicted. "It looks like we're capturing the demise of this dark vortex, and it's different from what well-known studies led us to expect," said Michael H. Wong of the University of California at Berkeley, referring to work by Ray LeBeau (now at St. Louis University) and Tim Dowling's team at the University of Louisville. "Their dynamical simulations said that anticyclones under Neptune's wind shear would probably drift toward the equator. We thought that once the vortex got too close to the equator, it would break up and perhaps create a spectacular outburst of cloud activity." But the dark spot, which was first seen at mid-southern latitudes, has apparently faded away rather than going out with a bang. That may be related to the surprising direction of its measured drift: toward the south pole, instead of northward toward the equator. Unlike Jupiter's GRS, the Neptune spot is not as tightly constrained by numerous alternating wind jets (seen as bands in Jupiter's atmosphere). Neptune seems to only have three broad jets: a westward one at the equator, and eastward ones around the north and south poles. The vortex should be free to change traffic lanes and cruise anywhere in between the jets. "No facilities other than Hubble and Voyager have observed these vortices. 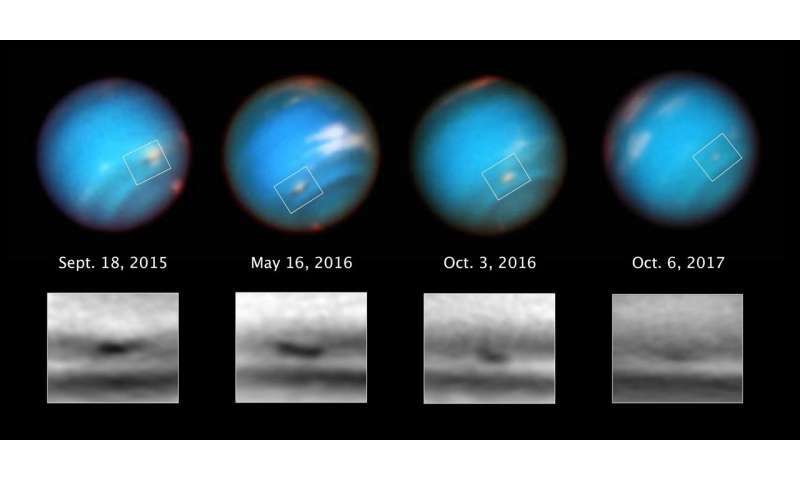 For now, only Hubble can provide the data we need to understand how common or rare these fascinating neptunian weather systems may be," said Wong. The first images of the dark vortex are from the Outer Planet Atmospheres Legacy (OPAL) program, a long-term Hubble project that annually captures global maps of our solar system's four outer planets. Only Hubble has the unique capability to probe these worlds in ultraviolet light, which yields important information not available to other present-day telescopes. Additional data, from a Hubble program targeting the dark vortex, are from an international team including Wong, Tollefson, Sánchez-Lavega, Andrew Hsu, Imke de Pater, Amy Simon, Ricardo Hueso, Lawrence Sromovsky, Patrick Fry, Statia Luszcz-Cook, Heidi Hammel, Marc Delcroix, Katherine de Kleer, Glenn Orton, and Christoph Baranec. Wong's paper appears online in the Astronomical Journal on Feb. 15, 2018.